"Summer resort" redirects here. For a children's summer holiday resort, see summer camp. For summer resorts in Canada, see cottage country. For resort hotels and resort towns in general, see resort. A hill station is a town located at a higher elevation than the nearby plain or valley. The term was used mostly in colonial Asia, but also in Africa (albeit rarely), for towns founded by European colonial rulers as refuges from the summer heat, up where temperatures are cooler. In the Indian context, most hill stations are at an altitude of approximately 1,000 to 2,500 metres (3,300 to 8,200 ft); very few are outside this range. Hill stations in India were established for a variety of reasons. One of the first reasons in the early 1800s, was for the place to act as a sanitorium for the ailing family members of the British rulers. After the revolt of 1857 the "British sought further distance from what they saw as a disease-ridden land by escape to the Himalayas in the north.Other factors included anxieties about the dangers of life in India, among them "fear of degeneration brought on by too long residence in a debilitating land." The hill stations were meant to reproduce the home country, illustrated in Lord Lytton's statement about Ootacamund, in the 1870s, "such beautiful English rain, such delicious English mud." Shimla was officially made the "summer capital of India" in the 1860s and hill stations "served as vital centers of political and military power, especially after the 1857 revolt." For a complete list, see List of Indian hill stations and Category:Hill stations in India. Genting Highlands, a hill station founded after the independence of Malaysia. Vaucluse in the eastern suburbs of Sydney. ^ Dane Keith Kennedy (1996). The Magic Mountains: Hill Stations and the British Raj. University of California Press. p. 24. ISBN 978-0-520-20188-0. ^ Barbara D. Metcalf; Thomas R. Metcalf (2002). A Concise History of India. Cambridge University Press. p. 111. ISBN 978-0-521-63974-3. ^ a b Kennedy, Dane (1996). The Magic Mountains: Hill Stations and the British Raj. Berkeley: University of California Press. Retrieved 19 Aug 2014. ^ Vipin Pubby (1996). Shimla Then and Now. Indus Publishing. pp. 17–34. ISBN 978-81-7387-046-0. Retrieved 16 August 2013. Crossette, Barbara. 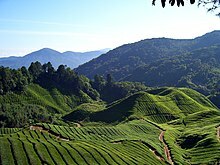 The Great Hill Stations of Asia. ISBN 0-465-01488-7. Kennedy, Dane. The Magic Mountains: Hill Stations and the British Raj (Full text, searchable). Berkeley: University of California Press, 1996. ISBN 0-520-20188-4, ISBN 978-0520201880. Wikimedia Commons has media related to Hill stations. Look up hill station in Wiktionary, the free dictionary.